XelAqua’s technology saves money and liability by providing a comprehensive solution using technology to treat site-runoff, process, cooling and waste-water. Utilizing their Magnetic Ballast Clarification water purification system, water supplies and contaminated water are rapidly and efficiently separated and clarified by removing particulates. XelAqua has a competitive advantage over other companies, as the size of the equipment is twelve times smaller and it is mobile to transport to the site. XelAqua’s water treatment technology can be used to treat waste-water in the following industries: Industrial & Process Water; Fracking; Farm Operations; Construction—Road Sites and Mining Site Operations. Alotech is the water purification system contract manufacturer for XelAqua. XelAqua had a technical issue with the machine, whereas they needed the machine to scrape magnetite off of the magnetic discs without it getting lodged in the system. The current equipment (comprised of 3 different parts) was not in working condition. Requiring an engineering solution, XelAqua needed this product to process over 300 hundred gallons per minute and remove solids from the waste-water. XelAqua had many concepts in mind, but needed a prototype to market. XelAqua approached Alotech for a technical, smarter solution to incorporate into the design, make it automated and make all 3 parts work together as a system. After checking with 3 facilities that would have charged a high price for markup, XelAqua turned to Alotech. — JIM CHAMBERS, DIRECTOR OF BUSINESS OPERATIONS AT XELAQUA, INC.
As the water purification system contract manufacturer for XelAqua, we were able to take a company that had an extreme technological advantage over competition and give them a path forward to scale the business. By offering the capital needed to build the prototype units, test the prototype and redesign the existing unit providing a new, improved XelAqua system. The biggest breakthrough was in finding a solution that alleviated the magnetite that was not moving through the system. 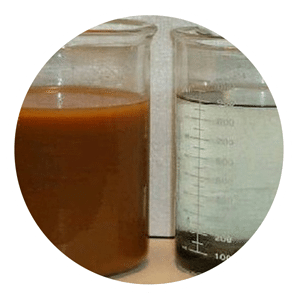 Instead of lodging in the system as sludge, our process was able to shear polymers off the magnetite thereby increasing the process to ensure just a minimal amount of magnetite was lost. This then maximized the recycling of the magnetite. We were able to bring the system in house since XelAqua was undercapitalized, saving them thousands of dollars. We did not charge XelAqua to manufacture a working prototype. Reduction of costs by 35% by treating the water in house, processing over 300 gallons per minute. The integration of all 3 pieces together made it smoother with PLC controls and monitoring. Previously, the water treatment process had not worked. With Alotech’s process, they made it work! Product turn around went from 2 years to 6 months!